I am sharing a method of converting a galvanometer into a voltmeter of range 0 to 3 volts. I performed this experiment in university lab. Apparatus: Galvanometer, High Resistance Box (HRB), power supply, two one way keys, volt meter (0 – 3 volts), rheostat, connecting wires and sand paper. First of all I found the resistance of Galvanometer (RG) by half deflection method. 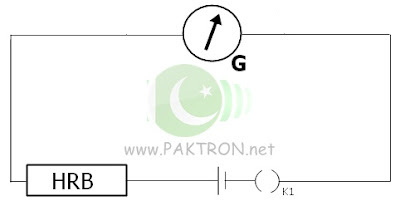 Then I made the complete circuit, as shown in the diagram, by connecting Galvanometer, HRB, and Keys with the help of connecting wires. I connected the circuit to the DC power supply through key K1. I adjusted the resistance (R) of HRB in such a way that there were deflections of 30 divisions in galvanometer. 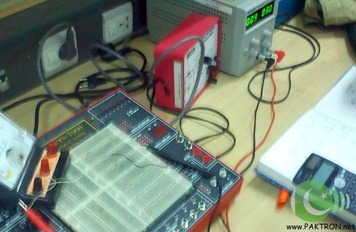 Then measured the ‘emf’ of the power supply with volt meter to know the merit of Galvanometer (K). 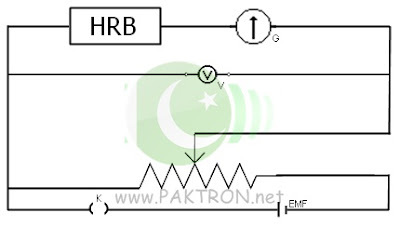 I adjusted the resistance (R) of HRB in such a way that there were deflections of 28, 26 and 20 divisions in galvanometer to find the mean value of merit of galvanometer. The difference between calculated value of voltage measured by converted Galvanometer and that measured by volt meter was near to 0. Found the least count of both meters by dividing their Range by Total number of divisions. 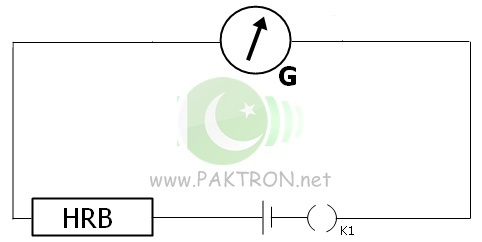 This is how to Convert Galvanometer into Voltmeter.